Some of our favorite pieces. Love iridescent gifts! Russell and Kitty here. Enjoy!! 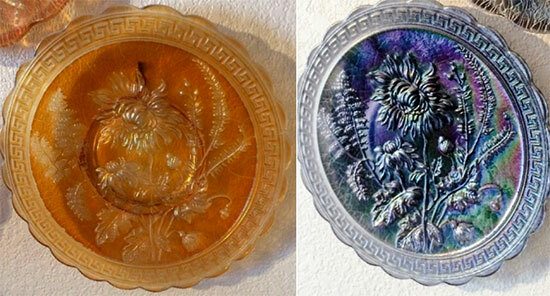 Imperial Heavy Grape Plates in Marigold (Rose Ice), White (Iris Ice), and Smoke (Blue Ice). All have the stretch finish. Two very different amethyst (Pearl Amethyst) Homestead Plates. The one on the right has been reheated after the spray “dope” was applied. Notice the sharp crisp lines on the plate on the left vs the more rounded lines on the right plate that was reheated. Since there was a lot of hand work done on both plates even though they were probably from the same mold, each plate is different. That difference is what makes carnival and stretch glass so much fun to collect. Each piece is similar, but unique. Rose Ice (marigold) and Blue Ice (charcoal) Imperial Chrysanthemum plates. Imperial Chesterfield #600 Pitchers and Tumblers in red and teal (Green Ice). Fenton Celeste Blue (all three are the same color of celeste blue, but photographed with different backgrounds) Orange Tree Spooner, Holly Plate, and Pond Lily Bonbon. Diamond Blue/Harding and green pieces of Adam’s Rib vases and candy jars. The pitcher is made from the same mold as the vases. Blue Crackle Square Vase. Four Flowers 11” chop plate in Egyptian Lustre. The stretch finish is so even on the plate that we are not sure if it was an experiment or the annealing oven was just too hot and the metallic spray “dope” contracted to make the stretch glass finish. This a question for your time machine travels! Northwood Royal Purple Rib Optic Vase. Sapphire Blue paneled vase #728; does anyone know the name of the pattern of the vase? Concave Diamond Bedroom pitchers and tumblers that fit inside of the pitchers. These are in the four known colors: Sapphire Blue, Topaz, Jade Blue and Russet. Does anyone have another color of the iridescent bedroom room sets? The reason why these pitchers were and are still so popular is that the glasses inside the pitchers keep the bugs out of the pitcher; also some companies had the glasses that fit over the top of the pitchers. US Glass Company Field Thistle showing the back side of the sauce plus a vase in blue (similar to celeste blue). Plus a Field Thistle in white which also has a stretch finish (not easy to capture on film). We hope that you have had fun looking at these carnival glass pieces with a stretch finish. Please send in your carnival glass pieces with a stretch finish. We would love to see more carnival glass with a stretch finish. These are our favorite carnival as well as stretch glass pieces! PS. We are happy that you enjoyed the article on Coin Spot Compotes. If you have any other colors of the Coin Spot compotes in carnival or stretch glass, please send in pictures of them.